In this article we will be building an Angular 6 application step by step from scratch with sample example. 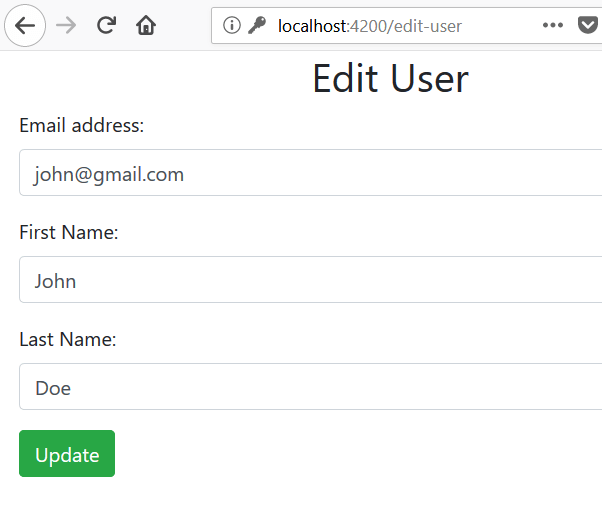 We will be generating our Angular 6 Hero application using angular CLI and then modify it to have a user management project where there will be a login screen for an admin and post login he can perform CRUD operations such as create, read, update and delete user with the sample REST API exposed using HttpClientModule. We will also be using RouterModule to have routing enabled. Also, at the end we will be integrating material designing with our Angular 6 app. In my last examples of angular, we had covered many topics on angular such as Spring Boot Angular Example, Angular JWT Authentication and Material Design with Angular and many more and in due course we had exposed some REST APIs to be consumed by the angular client. Hence, we will be using the same set of APIs here for the CRUD operation while building our Angular 6 app. Later, in the article I will be providing the API details. But for now, here is the spring controller class for the same on github. Angular v6 is the first release of Angular that unifies the Framework, Material and CLI. @angular/core now depends on. Both the CLI and generated project have dependencies that require Node 8.9 or higher, together with NPM 5.5.1 or higher. For this project, I have npm 5.6.0 and node v8.11.2 installed on my local system. You can download the latest version of Node js from here - Node Js Official. To update NPM, you can run the following command in the terminal. For a complete change log, you can visit here. 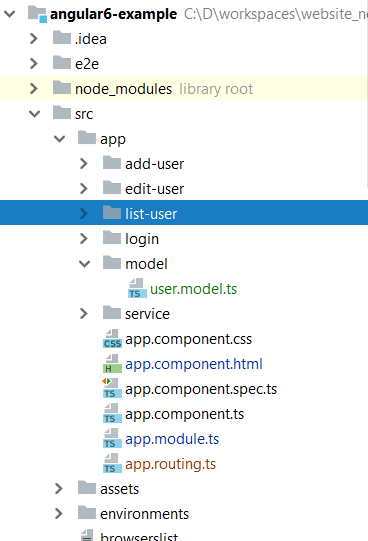 Once, the npm and node is upgraded to the latest version, you can run following command to generate angular 6 project in any location of your choice. Doing so, our angular 6 application is generated with TypeScript 2.7 & RxJS 6.RxJS 6 contains some breaking changes and hence a new package, rxjs-compat, can be installed alongside RxJS 6 to provide a compatibility layer while upgrading your code to the new syntax. There are certain files generated with CLI command which we need to understand here. We have angular.json file generated that has all the application configuration parameters. The configuration related to welcome html file as index.html, main.ts where all the modules are bundled. You can also find the final application output directory configuration and configuration specific to environment such as dev and prod can be found here. We have package.json file that has information about all the project dependencies. 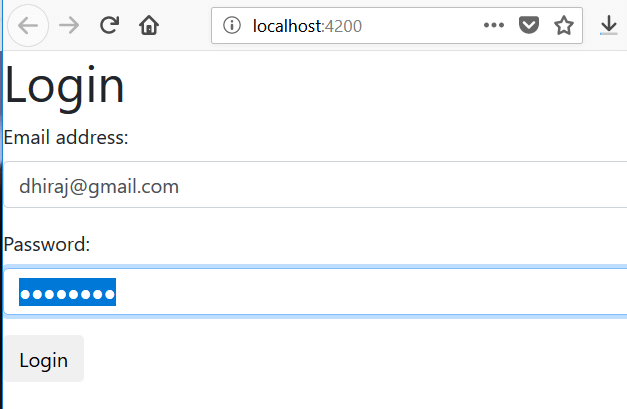 We have tsconfig.json for typescript configuration.Inside the scr/app folder we have our components defined and when the request for localhost:4200 is made, AppComponent is loaded in the browser. As discussed above, we will have multiple components such as login and add-user, edit-user, create-user. Once an admin login sucessfully, he can perform user CRUD operation.Following are the commands to generate our components. Following is the implementation of our UserService. 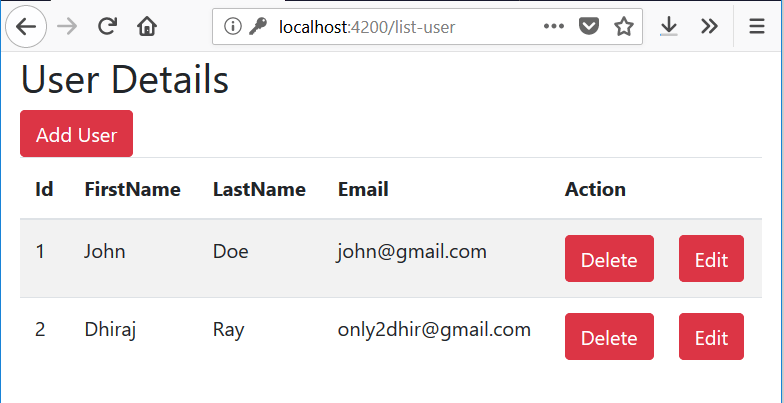 It has all the API details that is required for the CRUD operation.Also, for testing purpose, you can use following fake users. Below is the controller implementation class which is responsible for exposing endpoints for the angular app. After login, you can see following screen with list of users. On this page, you can perform actions to add, edit and delete user. Following is a sample screen for edit user. With the release of Angular 6, we can directly run ng add @angular/material command to add material design capabilities to an existing Angular application. By executing below command we will be installing Angular Material and the corresponding theming into the project. But in our existing project, we have included bootstrap 4 earlier to provide some styling and hence let us remove it first. To so so, open index.html and remove below scripts. Once, these scripts are removed, run above CLI command. Now, we will create a new module	with file name material.module.ts and import all the material design related module here and import it into our app.module.ts file. Doing so will definitely not add any material styling to our html pages. To achieve this, we require to re-write our html pages using material directives. Here, I am going to change only the login.component.html for demo purpose. Now, you can compare the difference between our previous and present(material designing) login page styling. You can download the source from github here.